CAP Talk | Operations | Tools of the trade | Topic: Unit Website Initiative Launch Date announced! Unit Website Initiative Launch Date announced! hosted website Content Management System to each unit, free of charge! What are the benefits of the new hosted solution? pages behind their pubic facing site. • Proper security protocols will be in place to safeguard content from vulnerabilities and hacks. • Enhances CAP branding efforts through alignment with gocivilairpatrol.com template. • Ensures that an automatic and secure backup process is in place. • Provides a responsive web design that will render on computers, tablets and phones. What type of capabilities will be available in the new CMS? Is the new hosted solution mandatory? year, but there is no expectation that all migration will have been completed in 2019. Once my unit requests a site, how long do we have to go live on the new CMS? capabilities and plan for your migration. request for a site for my unit? the IT page in eServices no later than 25 January. Re: Unit Website Initiative Launch Date announced! Is it Wordpress, or has Hdqs picked some obscure system. Most importantly ... can we keep our domain? Its crazy if we have to go back to the old sub-domain system. Some of us have spent lots of time getting good Google listings. Some of us have already spend months creating our own websites that have most of the features already touted here. If its Wordpress, we will have the ability to add Plugins for special features? We are using several. Or will we be hamstrung to all be the same vanilla website? Our website is "strictly" for marketing and publicity use ... so the whole OPSEC thing is irrevelent. 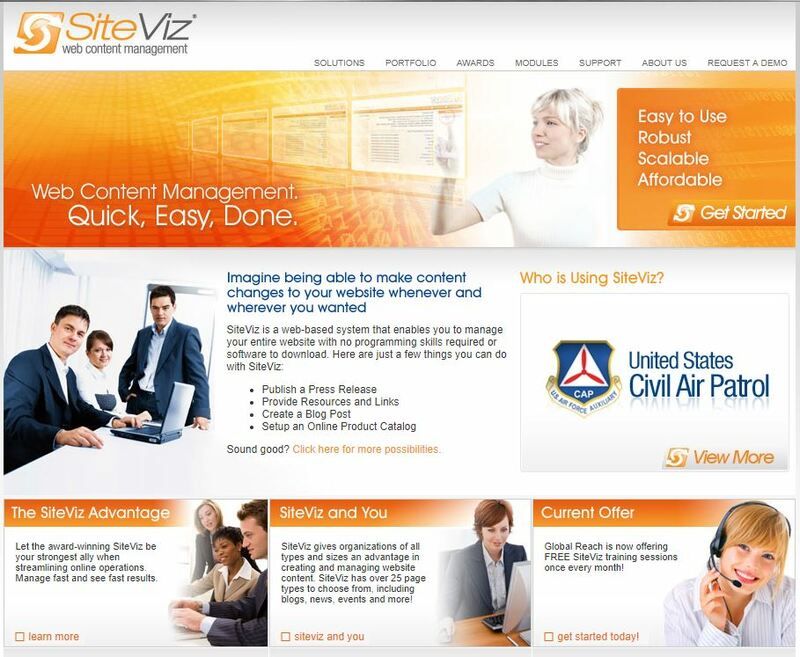 From what I understand, it's something called "SiteViz CMS" by Global Reach Internet Productions, LLC in Iowa. Never heard of it? Don't feel bad, neither had I--and I've been around the Internet for a good long time. Just what we need...another user database to maintain if we want to put any "secure" content on it. NHQ won't let us to SAML to eServices, so we have to build our own. Hopefully we can do Google authentication here so we can leverage the system we've built for members to log into our wing site. Gripe all you want. This is long overdue and welcome in my eyes. I could probably count on one hand, with fingers to spare, the number of actual quality unit sites I've seen over the years. Most are pure crap. If this brings greater standardization and a more professional overall appearance to the organization, I'm all for it. Geez. Who was at Hdqs the day the snake oil salesman walked in and sold a proprietary system that will leave every squadron in trouble when this company goes down? Nuts. ^^^^Global Reach has been the developer of the CAP NHQ website for years, longer than you've been a member. Their logo is at the bottom of the CAP homepage. Looking at the source code of siteviz.com its so similar to WP, like they just use WP, but change a few things here and there, just enough they can call it their own. Seen it before, so many times over the years. Will they give Squadrons Admin level access, or will it be Author only which is excruciating limiting. Still want to know about domains. I'd sure hate to go back to the sub-domains. If we can't use our existing domain, we could always just use that for marketing separately and put the "official" website on this new system. And everyone has been complaining about it for as long as I have been around. Please don't tell me its the same company that does WMIRS and eServices! Ouch! I have never heard or seen any complain. And I have been using WMIRS and eServices for a long time. My complaint is with some squadron themselves. They do great webpages. Providing lots of info for members and non-members alike. Then invite those looking at their websites to see their sites. When they have placed their website on, let's say, Facebook! I have to log on to Facebook to see a unit webpage? NO WAY! This is sine qua non! So, you have yet to see or use the actual product and you've already passed judgement?! You've made several comments here and in other threads about your website/social media. Care to share the URL to your unit page so we can take a look? Here's the thing, an effort is being made to provide a branded product that provides consistency across the org. Rather than fight and poo-poo it before it even gets launched, give it a shot and keep in mind the bigger picture. Yes. Its apples and oranges. A Facebook page has different uses than a website. Both can be great marketing tools. Squadrons look at these differently. Some build both with the primary emphasis member use. Ours is primarily marketing and advertising trying to reach potential new members. So, you have yet to see or use the actual product and you've already passed judgement?! Guilty as charged. I should have waited to speak. Its a done deal, so it doesn't matter anyway. We'll donate the time and effort to "redo all the work" we've done over the last 3 years on our existing website to convert to the new "official" website template for our squadron as mandated, then go on about our usual business. According to the question/answer section, while all units will be required to convert over to the new system, there is currently no deadline, and it does seem to suggest the conversion process may be a multi-year project. So, once the system becomes available, see what it will take to convert and make a plan. I have seen some outstandingly great unit websites, and many more...pathetic/ancient/out-of-date unit websites. And that will not necessarily change. How good is the local photography that the website will be filled with? Does it tell a story and grab people's attention? Is it filled with snapshots, or is it carefully planned out based on the content of each page? So while, yes, a new CMS may give the tools needed .... don't expect every squadron to all of a sudden have a wonderful website. But yes .... an answer has been needed, to give those squadrons without access to a web developer, to able to get something online. Maybe the first few new sites will give them a model of some content they can brainstorm with. The CG Aux has been doing this for a number of years and the result is that almost every unit does have a website. However, most of them are a generic site in which the only local content is contact information drawn from the national directory. Most units are not adding much of their own content and very few seem to be taking real advantage of the capabilities. But, if the goal is to at least have a basic site for all units, it works. Yep. Personally, I think there should be a wholly different track/position/category/whatever for a position of Marketing/Advertising. Too often it gets lumped into Public Affairs Officers and/or Recruiters. Advertising is a very different animal than PAO's "News Releases". Both are great and needed. But its a different mindset, when you want your website and social media to draw people in. Yes, some folks are good at it all .... but the training for PAOs is more geared toward writing releases for the newspaper and gov't officials ... as opposed to how to write a catchy ad that will grab a 14 year old's attention on Facebook. I'd like to see a whole new track for that. Boy, if only you had a forum full of a captive audience to start a "Marketing/Advertising your Unit" thread with some of your best practices on the topic.